Visit my post “Cheap Alternative to Argus” to download the fully functioning Excel spreadsheet. Property Valuation Model. This is a .pdf copy, the original is in Microsoft Excel. A popular “turn-key” computer program to develop Pro Forma is Argus, although those that create their own usually use a spreadsheet like Microsoft Excel. The benefits of Argus to a novice without the necessary modeling skills are legion, but then so are the dollars that you’ll need to shell out for its purchase. Excel is easily manipulated and probably already installed on your computer. But in Argus’s defense, it is true that unless you are very proficient at Excel it can be quite challenging to create a scratch-made Pro Forma from Excel that is dynamic. What is a dynamic Pro Forma model or template? A dynamic Pro Forma template is one whose assumptions and inputs can be changed easily and quickly without having to rewrite the equations. If you have to rewrite your template to incorporate a floating-rate loan rather than a fixed-rate loan, for example, your model is not a dynamic Pro Forma template and it will be much more time consuming to test different scenarios. If you can’t change the holding period of an investment from ten to fifteen years with a single key stroke, your template is not dynamic. Without a dynamic Pro Forma template, changing assumptions and exploring alternate scenarios is expensive and difficult. And non-dynamic, or static, templates reduce your ability to maneuver in a negotiation? Just imagine that you’re a developer and an investor you’re trying to attract would feel more comfortable if operating expenses in the Pro Forma you emailed her are increased at 3.5% rather than 3.25%. Should you push back or let her have her 0.25% increase? You won’t know until you re-model it. With a dynamic Pro Forma template you’ll have the answer on the same phone conversation in which she raises her position, whereas with a static model you’ll need to call her back, tomorrow most likely. And the more back and forth that ensues, the more you’ll need to rewrite your model. 1.) 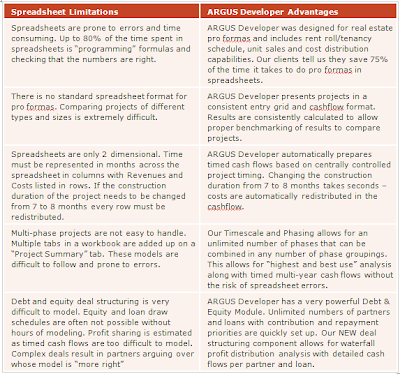 Spreadsheets are prone to errors and building a model is time consuming because a good model is a dynamic model– that’s why most users of Pro Forma who don’t purchase Argus employ financial analysts or contract underwriters with a combination of financial knowledge and spreadsheet skills to create and operate a proprietary Pro Forma model. Why do some opt for analysts using templates or contract commercial underwriting over Argus? Because with Argus you’re in a kind of straight jacket – unless you’re hired as an Argus programmer, you’ll have no say on the structure of your model beyond what’s provided by Argus, dynamic or not. By the way, rent roll/tenancy schedules are de norme in a development Pro Forma. 2.) That’s partly wrong and partly right: there is a standard Pro Forma format in that everyone expects to see cash flows in columns representing different periods of time in the future and an expected return; but it is true that there is no official spreadsheet sanctioned by some authority and it does take time to familiarize yourself with a particular Pro Forma and how it represents information. That’s why it’s good to settle on a certain Pro Forma template early on and become comfortable understanding its representation of cash flows and the subsequent returns. Does that Pro Forma template come from Argus or elsewhere? That’s your decision. But settle on Argus or an EXCEL template early on and feel comfortable that the general Pro Forma format is universally understood – Argus doesn’t have a monopoly on that. 3.) All Pro Forma templates are two dimensional, including Argus’s. “Argus Developer automatically prepares timed cash flows based on centrally controlled project timing. Changing the construction duration from 7 to 8 months takes seconds – costs are automatically redistributed in the cashflow”. Confused? This is Argus’s attempt to say that its models are dynamic. Spreadsheets templates can be dynamic. See criticism #1. 4.) There are a variety of ways to define and represent the various phases of a development in a development Pro Forma template. If you don’t like the different phases separated on different Excel worksheets – and I agree that this approach is not very dynamic because it’s difficult to automate the creation of a worksheet– put them onto one worksheet with the labeling and operating information for each phase controlled dynamically with reference equations. 5.) Modeling properties held in Limited Partnerships like those using Tax Credits make extensive use of waterfall profit distributions (aka mezzanine waterfalls), but I can’t think of a single affordable investor or developer who uses Argus for modeling developments or assets, it’s just doesn’t allow for the freedom of movement necessary to create the waterfall distribution structures that are as complicated as a room full of bond council can make them.